I have wanted to try this technique for a long time now. And I’m going to teach a class on it in the fall. If you have a sewing machine that is capable of embroidery, you can do it too. 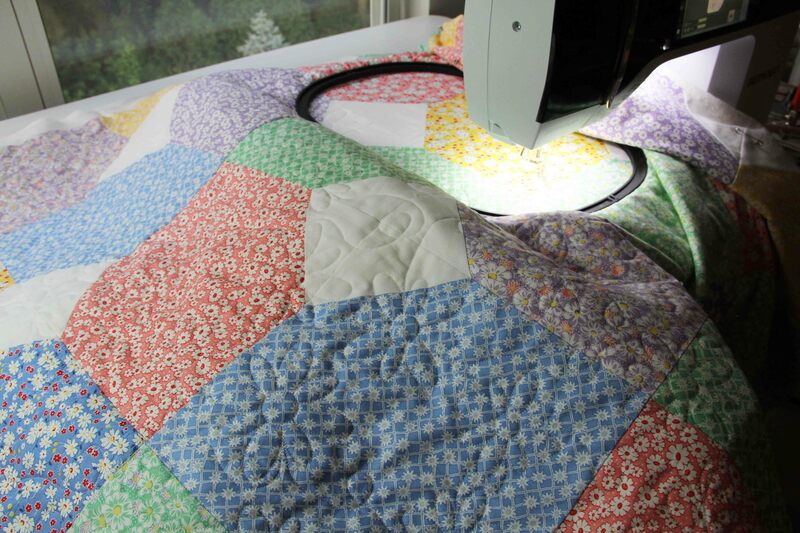 Many people love the look of a quilt that has long-arm quilting. 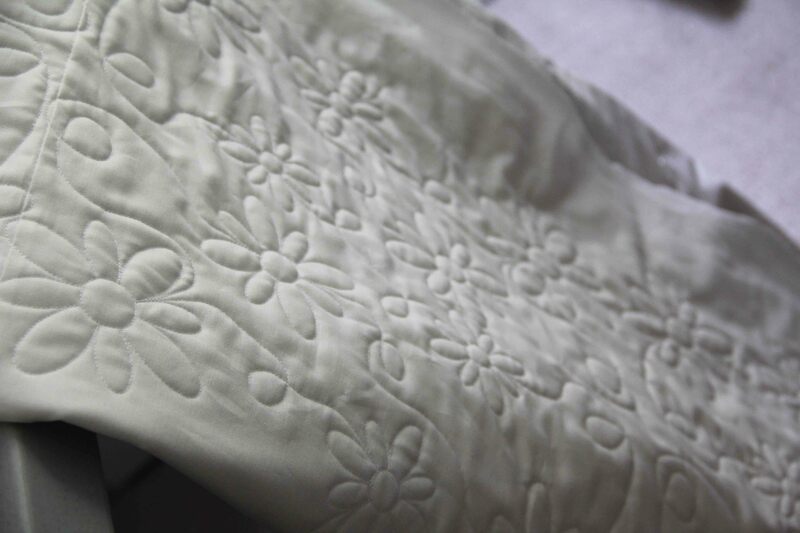 It gives a very polished, professional look to a finished quilt. 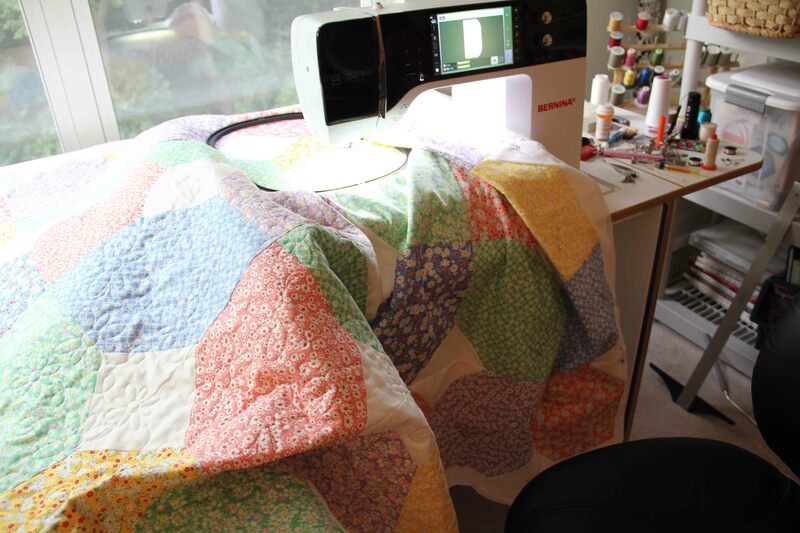 Most of my quilts I use free-motion and do them at home. As you know this is awkward with larger quilts, twin size and up. 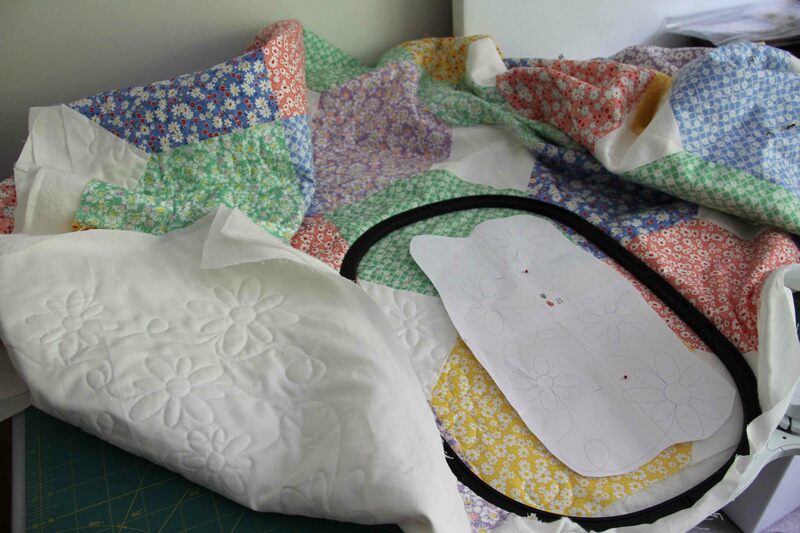 But using your embroidery module to quilt is really worth trying, especially if you are someone who is comfortable with embroidery (hooping and hooping over and over…and if you’re not familiar, what a great way to get good at it). 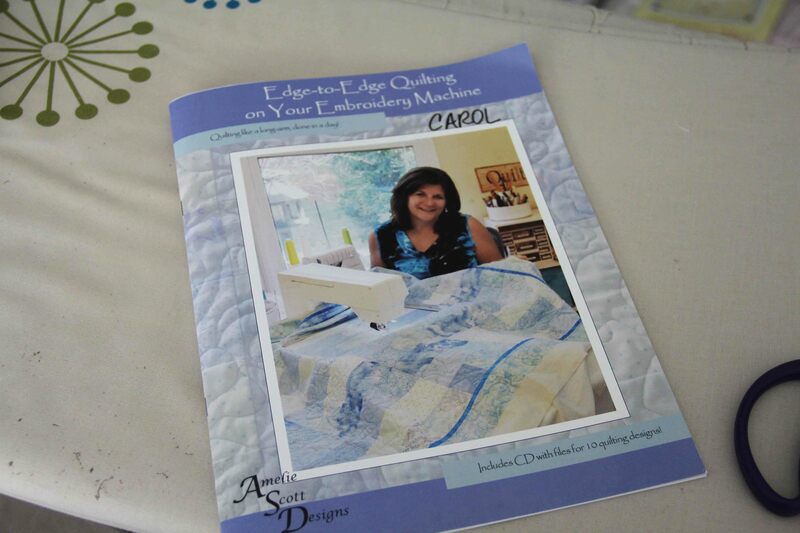 She provides special quilting embroidery designs that have an easy start and end point. All the work is in the positioning and the time invested in the stitch-outs and hooping. As you can see on my quilt, you will still be hefting around a a lot of fabric. And by far, the trickiest part is calculating the number of hoopings and working out the positioning. But that’s just a little bit of math and little bit of decision-making. You use 2 different files…an “A” and a “B” file. You alternate them in rows so that the design looks randomly spaced. This really does work and the finished quilting technique is lovely. While I can free-motion some great spirals or stippling or loops or hearts, I know I would never be able to get the perfect consistent quality of these daisies. This 60 x 60 in. quilt took 32 hoopings, and my time invested was somewhere around 7-8 hours at the machine. I love the way the quilting looks — whimsical, yet professional. Would I want to do this for every quilt? Of course not. I like to be able to customize some of my quilts. Is this great for gift-giving and finishing some of those UFO’s? A resounding yes! And a terrific way to get more use out of your embroidery module. Your local quilt shop should be able to get you the book. What are you waiting for? Let’s get those quilt tops quilted! This entry was posted in embroidery, machine embroidery, quilting, sewing and tagged machine embroidery, quilting by edges. Bookmark the permalink. The Amish ladies have NOTHING on you Carol!! Thanks! I think I just take advantage of a lot more technology.